Haifa, Israel, May 18, 2009 – Elbit Systems Ltd. (NASDAQ:ESLT) announced it has been awarded a contract valued at €25 million to supply the Austrian Army with Elbit Systems' new 12.7mm unmanned Electrically Remote Controlled Weapon Stations. The systems will be delivered over the course of the next four years. 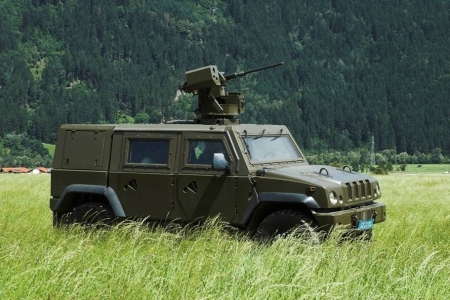 The contract for the Austrian Army was signed between Elbit Systems and IVECO S.p.A., a subsidiary of the Fiat Group, prime contractor for the program. The Weapon Stations provided by Elbit Systems will be integrated into IVECO Defence Vehicles' Light Multi-role Vehicles (LMV) 4X4. In addition to the day and night detection systems, Elbit Systems' weapon stations include a Multi-Threat Detection System (MTDS), capable of detecting, categorizing and pinpointing Laser, Radar and RF Sources. The MTDS provides a solution to threats caused by a variety of sources. The new weapon station is based on Elbit Systems' expertise and combat proven fire control systems, drive systems and electro-optic systems. The system is highly suited for Light Multi-role Vehicles, enhancing the vehicles' capabilities by adding both sensors and firepower, with little increase in overall percentage of vehicle weight. Bezhalel (Butzi) Machlis, General Manager of Elbit Systems Land and C4I Tadiran, said: “We are proud to have been selected to take part in this important project for the Austrian Armed Forces. Elbit Systems' co-operation with IVECO Defence Vehicles reflects the level of recognition we have achieved with our customers and international partners. The selection of our systems constitutes a breakthrough in an emerging international market emanating from a shift in the modern battlefield."